After more than one year in the making, here's the first full version of the I Hate Mountains Left 4 Dead campaign. This version only works with Left 4 Dead 1. See the README.txt file for more informations. 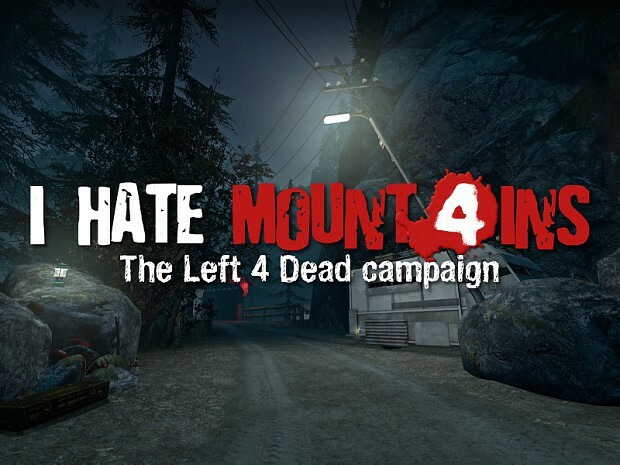 Any computer that can run Left 4 Dead campaigns should be able to run I Hate Mountains decently. We'd recommend that your computer specifications slightly exceed what's recommended for Left 4 Dead since our campaign is a bit greedier in some places. Temporary disable any custom campaign you may have installed except I Hate Mountains because they can overwrite themselves pretty bad due to engine limitations. To do this, go to Menu > Extra > Add-ons and uncheck the checkboxes near each content. This only include waterfalls, rotor wind, sprinklers rain and such, but plays a huge role in immersion. During the development, there's a few things we had to accept and among these is the fact that not everything is possible in a Left 4 Dead campaign. Because of this, there's a few problems we are aware of but can't fix or didn't had the time to fix before release. Here's a little list just so you guys know what's going on. Congrats on the release. Top notch work here. Epicness has reached critical mass!! That's some fine thing to do. This will forever be known as the first day anyone has played l4d1 in over half a year. My new favorite campaign =). Open, expansive, realistic, and well spaced. I wouldn't be surprised if these guys get hired by Valve. That's how good this is. its so epic i can see dead people!!!!!!!!!!!!! !